Four hundred years ago this month, on 7 February to give the exact date, the first records of christenings and marriages were written into Ireland's earliest surviving church register. The volume, from the parish of St John the Evangelist in Dublin, continued from 1619 to 1658, and gives a fascinating glimpse into the life of this inner-city parish. 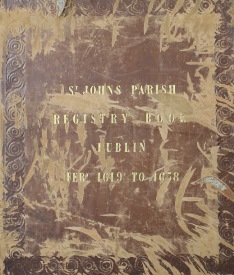 Held by the Representative Church Body Library in Churchtown, Dublin 14, the register is in immaculate condition and is the focus of the Library's Archive of the Month online exhibition, which you can view here.